Cosmeston Park is a picturesque country park formed from limestone quarries. It has its origin in limestone quarrying in the early 1890s. Parts of the previously quarrying area were flooded when quarrying ceased in the 1980s, forming an extensive area of lakes and wetlands. The Cosmeston Park is located in the Penarth district of Cardiff. Extensive landscaping has transformed Cosmeston into an area of woodlands and meadows, rich in wildflowers and animals. The Park covers an area of over 100 hectares with lakes, woodlands and meadows, which is open to the public all around the year. It has contrasting wildlife areas, which is a delight to nature lovers. Around 46 hectares of the Cosmeston Park is designated as S.S.S.I (Site of Special Scientific Interest) protecting the rare and diverse plant and animal species. A walk along the tall Bulrushes and Reed beds or through woodland will offer a visual treat of a variety of birds, foxes, grey squirrels and many other animals in their natural habitat. The other major attraction at the Cosmeston Park is the Medieval Village. The Medieval village was built from the remains of a 14th century community, which were discovered and excavated during the 1980's by a team of archaeologists. The whole-excavated site was reconstructed under a heritage plan of the British Government. Hence today visitors can see the excavated buildings and gardens re-created, costumed villagers tilling the land and livestock of the Middle Ages roaming the paddocks and fields. The visitors get a feel of medieval life by taking a tour of the village with a costumed guide. 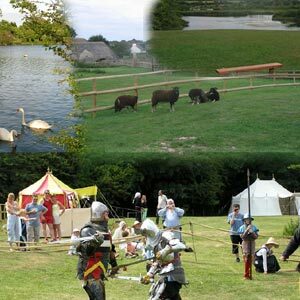 The Cosmeston Park is open every day and admission is free while the medieval village charges ?2.00 for children to ?7.00 for the family. The visitor center provides information about the park and medieval village. The center also houses a gift shop and cafeteria.